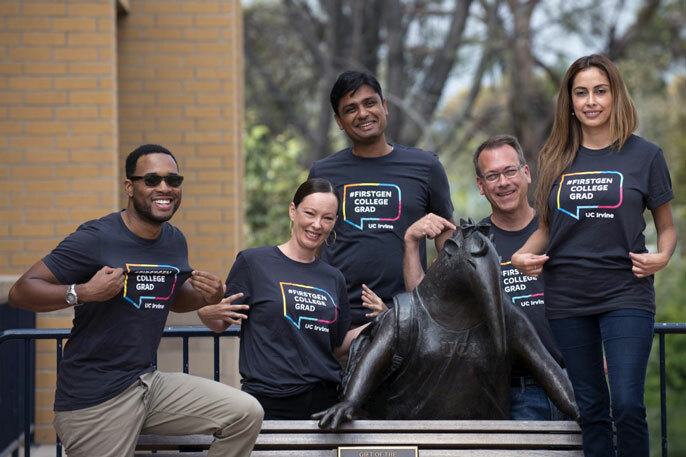 First-generation UC Irvine faculty prepared to support students facing the same challenges they once overcame include (from left) Davin Phoenix, Anita Casavantes Bradford, Manoj Kaplinghat, David Igler and Glenda Flores. The T-shirts tell just part of the story. Professors at the University of California, Irvine, in an effort to support the 60 percent of students who are the first in their families to go to college, will don distinctive shirts and buttons during Welcome Week, identifying themselves as first-generation graduates. They are part of an initiative started two years ago by Anita Casavantes Bradford, UC Irvine associate professor of Chicano/Latino studies, that aims to train relatable faculty as mentors and allies of undergraduates unfamiliar with college culture. While these faculty members have a common mission, their stories are unique. Read on for examples of how these remarkable professors found their passions through higher education. And when you see them on campus this week, give them a high-five — or take a selfie and hashtag it #FirstGenUCI. “By the time I was 8, I had figured out we were poor,” says Anita Casavantes Bradford, a UC Irvine associate professor of Chicano/Latino studies. A monthly ritual brought it home for her. That same year, she won the annual scholastic medal, awarded to the child with the best academic performance. “I had a very kind third-grade teacher who made me feel special,” she says. Casavantes Bradford did her own math and realized right then that education was the way out of hunger and poverty. “If I didn’t want to be poor and afraid, I needed to be good at school,” she says. She decided to be the first in her family to earn a high school diploma and a college degree. It was no easy journey. As a community college student, Casavantes Braford worked full time as a live-in housekeeper and nanny. As a first-generation student, she had no family members to turn to for advice on how to navigate classes, finances and extracurricular activities. She felt isolated and perpetually exhausted. But she persevered, transferring to a prestigious four-year university and earning a bachelor’s degree and a teaching certificate. Casavantes Bradford was a high school teacher by age 23 and loved it. She became engaged to a U.S. Marine and, to her surprise, was accepted as a doctoral student at UC San Diego. She’s been at UC Irvine since 2011. Asked if she sees young people in her classes that remind her of herself as an undergraduate, Casavantes Bradford replies, “Every day.” When she began teaching, she noticed that first-generation students in particular weren’t taking advantage of her office hours. She knew faculty advisers were critical to student success. Now she makes a point of telling each new class that she was a first-generation student. There are lines outside her door. More than half of UC Irvine’s current student body are first-generation students, and Casavantes Bradford and others want to ease what can be a daunting experience. She started a popular faculty mentoring initiative two years ago. Last year, she and co-director Davin Phoenix, an assistant professor of political science, worked with a dozen first-generation upperclassmen, developing a peer-to-peer mentoring program that kicks off this fall. Davin Phoenix felt the weight of family expectations early on. As the only child of an African American mom on active duty in the U.S. Air Force, it was drilled into him that he would go to college and become an engineer. “I was raised with the explicit understanding that there was no other option,” he says with a smile. For a shy, self-described nerd who enjoyed school and earned good grades, going to college made sense, though he’d be the first in his family to do it. But he wasn’t sure about engineering. Phoenix was in the second week of his freshman year at Christopher Newport University when two planes hit the World Trade Center’s twin towers. He’d already grown interested in politics as a high school senior, witnessing the fierce 2000 presidential contest between George W. Bush and Al Gore. His small liberal arts college in Newport News, Va., gave him four years of freedom to study what he liked. Engineering faded, and his interest in the intersection of race and politics grew. Phoenix wasn’t sure how to make a living in political science, but he applied to graduate school and was accepted at the vaunted University of Michigan. “It was easy to sink or swim, and oftentimes I felt like I was sinking. But I was able to make it,” he says. Phoenix earned a doctorate in public policy and political science and is now beginning his third year of teaching and conducting research at UC Irvine. He remembers his own experiences when he interacts with bright, young students on campus who are the first in their families to attend college. As co-director of the First Generation First Quarter Challenge, he’s helping train student leaders to ensure they have the skills they need to offer incoming freshmen insights and support. Both the student leaders and the freshmen they will mentor are remaking the image of the American working-class household, Phoenix says. At UC Irvine – where an entire wall of his sun-splashed office is covered with scrawled equations about a possible “dark hydrogen atom” – Kaplinghat specializes in trying to uncover the mysterious, invisible elements and forces that drive the expansion of the universe. Born and raised in India, the theoretical physicist traces his fascination with cosmology to a 1987 exploding star – or supernova – that was visible to the naked eye. “I didn’t actually see it, but I read lots of stories in the press and couldn’t get enough,” he recalls. A few years later, Kaplinghat became the first college graduate in his family and then headed to the U.S. to earn a Ph.D. in physics at The Ohio State University. After postdoctoral work at the University of Chicago and UC Davis, he landed a job at UC Irvine in 2004. The segue from India to America hasn’t been entirely smooth. Kaplinghat still grapples with a sense of limbo. “I feel equally at home and not at home in both countries,” he says. Nevertheless, he enjoys Irvine, where he lives with his Indian-born wife and their 5-year-old daughter, and he says the U.S. affords better opportunities for his research. Working at a dry cleaner shop starting at age 10. A third-grade teacher’s reprimand for solving math problems with a method taught by her Mexican immigrant mother. Watching her construction worker father singlehandedly build his family a new house behind their old one on a “sometimes scary” Orange County street. Talk for a spell with Glenda Flores, UC Irvine assistant professor of Chicano/Latino studies, and various out-of-the-ordinary memories emerge from her childhood in a rough Santa Ana neighborhood. Although some folks might leave such environments and never look back, Flores – the first in her family to finish college – decided to return to her community to give back to other youngsters. Before graduating from UC Irvine, she had planned to work as a bilingual elementary schoolteacher in the Santa Ana Unified School District. But as controversy engulfed dual-language instruction programs and some efforts were dismantled, she switched to education research and went on to earn a Ph.D. in sociology at USC. Her doctoral work grew out of observing white schoolteachers running classrooms full of students from blue-collar Latino families. Too often, Flores says, the teachers viewed ethnic cultures and practices as obstacles to learning, as was the case with her own third-grade math instructor. Now back at UC Irvine, Flores has continued digging into the issue. Sitting in a third-floor office decorated with portraits of artist Frida Kahlo, she recounts spending two years interviewing educators and parents in Compton and Rosemead for a new book, Latina Teachers: Creating Careers & Guiding Culture. Due out next year, it explores how Latino faculty preserve cultural identity among students, sometimes by surreptitiously “subverting workplace rules.” Her next book will focus on Latino physicians. Once there, he discovered that most of the students were far better prepared than he was to navigate the college experience. Undaunted, Igler earned bachelor’s and master’s degrees in American studies in just five years, with plans to become a high school teacher or a journalist. Igler has been teaching at UC Irvine since 2004, and although he doesn’t consider himself a role model, he does think it’s very important to share his background with today’s first-generation students.